a) The Subscriber must register to join the raffle promo. To register, text CHOOSESUB <Name>/<Complete Address> and send to 303. Once registered, the Subscriber is eligible to join the raffle draws for the entire duration of the promo. b) As the raffle promo will have a retailer partner, the Retailer must also register before he is eligible to join the raffle promo. To register, text CHOOSERET <Name>/<Subscriber Mobile number>/<Complete Address> and send to 303. Once registered, the Retailer is eligible to join the raffle draws for the entire duration of the promo. 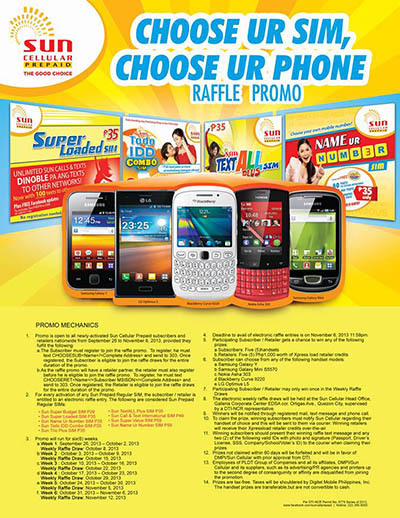 Visit Sun Prepaid Facebook Notes for full details and Sun Prepaid FB Page for the latest updates.